Theodore Roosevelt’s great image of politics as a kaleidoscope hardly captures the present pandemonium over Herman Cain’s alleged sexual misdeeds. For a Republican primary, usually a pretty button-down affair, this is pretty steamy stuff. Compared to Bill Clinton’s escapades-proven, admitted and forgiven by his wife, Hillary — this matter is still in the realm of he said/they said with a heavy cloak of court-ordered confidentiality obscuring full transparency. The issue of sexual harassment is so fraught with sexual political baggage (hey, Gloria Allred is representing one of the women), that one wishes this whole affair would simply go away. Unfortunately for the Cain campaign, it won’t. As your basic white, male, young Republican lawyer, decades back in St. Louis, I harbored the usual amount of skepticism about sexual harassment claims seeking a financial settlement. However, after having defended such a claim on a comprehensive insurance policy years ago, I must admit to having altered my perspective at least to the extent of understanding that each case must be examined on its own merits. In my case a manager, not the owners of a business, was accused of really coming on to a young woman employee who practiced an exotic but generally benign religion. Truth be told, I originally perceived her, the plaintiff, as a bit strange and a whiner — until I started interviewing other past and present female employees who pretty much confirmed that the subject manager was a total hound when it came to hitting on women in his charge. I recommended a modest settlement to the insurer and insured which the plaintiff, ill-advised by her attorney, accepted without too much negotiation. As the (civil) defense lawyers say, it was a “good outcome” in that we paid a fraction of what the claim was probably worth if tried to judgment. Lesson learned. As the father of five daughters, I confess to going crazy at the thought of some loser pulling this stuff on one of them. So experience and familial status have caused me to take pause when these kinds of allegations are made, especially when four or five such incidents are alleged, rather than just dismissing them out of hand. In truth, Herman Cain is in a no-win situation. How does one prove a negative? And the fact that the legal settlements are confidential makes it hard for him to demonstrate that, maybe, they were simply nuisance suits settled for costs if that is, in fact, the case. But what are we to make of a fellow, who seems to have such a run of bad luck if bad luck it is? I say this as someone who has been warming to Cain, impressed with his demeanor and certainly with his very articulate economics advisor, Rich Lowrie, who, in various interviews, is articulate, knowledgeable and capable of explaining supply-side economic principles as well as Arthur Laffer — a Jack Kemp, may he rest in peace, on decaf. This brings me to the critical question for those of us who still harbor quaint ideas about marriage, family and spousal loyalty. Where is Herman’s wife, Gloria? We have Herman Cain’s statement to Bill O’Reilly that his wife was “disgusted” by the allegations. She is “200 percent supportive of me,” he says. But we have not heard that from her directly as of this writing. Hillary Clinton, for whatever reasons, stood by her man when push came to shove. It is probably no exaggeration that, for love, money or power, she saved Bill’s derrière and his presidential aspirations. I voted against Bill Clinton, but I did believe that, if a husband and wife patch things up and tough it out, well, most of us will leave it at that. He may be a scoundrel, but his wife sees something in him anyway. Obviously, many voters drew the same conclusion. Unfortunately for Herman Cain, I am not sure even a joint appearance with his wife on 60 Minutes will turn the trick. Bill Clinton had, at the time, only Gennifer Flowers to explain. Herman has the equivalent of a whole women’s basketball team to contend with. 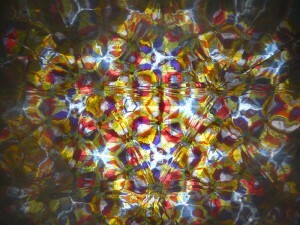 The kaleidoscope turns again. What array of colors will next appear? Yawn!….What else is the gossip media going to cover? They are not out to inform but to smear and destroy. If they were to cover real news with just some degree of truth then their darling messiah is finished. They have to pave the way for his reelection because they’re paid to do so by some big money that’s floating around within this regime. How else could we explain that the smartest dumb a.. got into power in one of the smartest nations on earth. The media is out to destroy Cain because of his front-runner status (and because he has committed the unforgivable sin of being a conservative black man). How else to explain how all these allegations from 14 years ago suddenly surface when Cain becomes the front-runner, and that all the accusers hail from Chicago – a place Cain has never lived, but the hometown of our illustrious President and his operatives? I usually believe that “where there’s smoke, there’s fire” – but all of this taken together just sounds too fishy to me. Herman Cain’s wife stands 100% by her man and says that if the things being said about him are true then he must have a split personality because it just isn’t in his character.